13.2.1 The first main screen is the "Status"
13.2.2 The second main screen is the "Settings"
The DCDC-NUC was designed to provide user specified(+12V or +19V) regulated power output from a wide input voltage(6V-48V). Default output setting is set to +12V. It has a range of intelligent functions not found in any traditional USB DC-DC converters. The unit is able to send ON/OFF ‘pulse signals’ to motherboards based on filtered input voltage levels or Ignition sensing, making it an ideal device for automotive or battery powered installations. Two main modes of operation are possible:DUMB and AUTOMOTIVE. The output voltage setting (12V or 19V) can be changed through the Configuration switches . The configuration switches can also be used to enter bootloader mode for updating firmware which is detailed in Bootloader Mode section. More advanced parameters are detailed in the Parameter list which can be configured using the Configuration Software. Without any further settings if the input conditions are satisfied the unit will generate +12V regulated. Further parameters can be customized by changing in the Parameter List. For configuration or firmware update USB connection is sufficient. 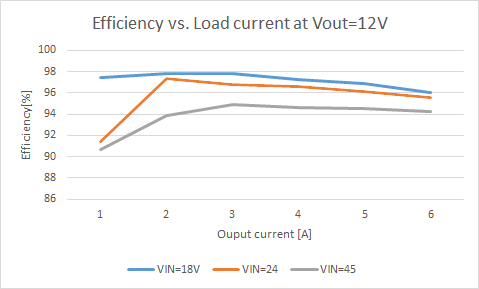 In this mode starting can be performed by applying an input voltage higher than the value set by the VIN_MIN_STARTUP parameter.In order to filter out unwanted noise the input voltage should be higher than this threshold for the duration set by the VIN_COUNT parameter. 12V output and Thump output will be activated. After output is ON and a timeout elapses set by the MOB_PULSE_TOUT parameter, the motherboard will be pulsed with a 500ms pulse set by the MOB_PULSEWIDTH parameter. During ON state output will be only turned OFF immediately if the filtered input voltage becomes less than the threshold set by the VIN_MIN_RUNNING parameter. In this mode Starting can be performed by applying input voltage higher than the value set by the VIN_MIN_STARTUP parameter and applying ignition voltage higher than the IGN_HIGH_THRESHOLD parameter. The input voltage should be higher than VIN_MIN_STARTUP for the duration set by the VIN_COUNT parameter. The Ignition voltage must be higher than IGN_HIGH_THRESHOLD for the duration set by the IGN_COUNT parameter in order to filter out unwanted noise in automotive environment. After Ignition is considered ON output will be turned ON after IGN_ON_TO_OUTPUT_ON_TOUT elapses. 12V output will be activated. Thump output will be activated after timeout elapses set by the THUMP_TOUT parameter. If Ignition is considered OFF the motherboard is pulsed for shutdown after IGN_OFF_TO_MOB_PULSE_OFF_TOUT elapses. After the HARD_OFF_TOUT timeout elapses the output will be turned OFF and the unit will enter in a low power state. The following options are available to control the motherboard by pulsing the on/off pins on the motherboard. First the the motherboard on/off pins should be connected to the P4.1,P4.3 pin on the P4 Interface_connector. The pulse width is 500ms by default which can be altered by changing MOB_PULSEWIDTH parameter from the Parameter_List. There are various ways to control the motherboard depending the configuration of the CONFIG1 register from the Parameter_List. Example:If startup of the motherboard is not needed when input is present, the startup pulse can be disabled by setting CONFIG1.b1 to 0. The same way the shutdown pulse can be inhibited by setting CONFIG1.b2 to 0. There are cases when motherboard started(ON) or OFF presence must be detected in order starting/stopping by pulses behavior work properly. For example the Operating System could be shutdown already from software. In case the unit is is a shutdown sequence not knowing this piece of information would lead by sending the shutdown pulse which would wake up instead the system. There are two kinds of feedback information to detect motherboard status. The first detection mode is by measuring the consumed output power, knowing that a motherboard when started consumes much more power than when in standby. 1. Enable this feature, CONFIG1.b3 should be set to 1. 2. Observe and note the consumption of the connected motherboard when in standby and when is ON. Our unit measures the output power(POUT) which is displayed in the configuration software. 3. Set POUT_HIGH_THRESHOLD and POUT_LOW_THRESHOLD parameters from the Parameter_List accordingly with a good margin. POUT<POUT_LOW_THRESHOLD motherboard is considered OFF. POUT>POUT_HIGH_THRESHOLD motherboard is considered ON. The second detection mode is by measuring the +5VUSB signal. Usually motherboards turn OFF the +5VUSB signal when they are OFF. In order to enable this feature CONFIG1.b5 must be set to 1. If CONFIG1.b4 set, the PSU can shut down the OS by sending a Power Button event on USB. Switching between the two available output voltages must be done with the device powered off. when making a firmware update via “bootloader mode”. There are two ways to enter in bootloader mode: 1a) or 1b). 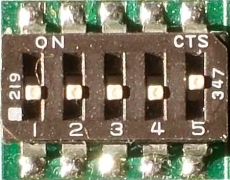 1a) Slide the SW1 DIP switch button 1 in ON position. 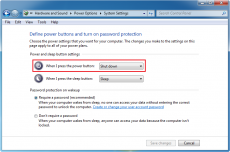 1b) Press the Switch to bootloader button on the configuration software's user interface. 2) Start the HIDBootloader v2.9j.exe software provided to flash the new firmware. 6) If used option 1a) slide the SW1 DIP switch button 1 in OFF position, else skip this step. 8) After the device reconnects on USB with the configuration software the new firmware version will be displayed in the title bar of the software. de-rating up to 30% might be necessary, forced ventilation required. For long life operation, please ensure that hottest component on-board is kept below 65C. Standard Hardware Warranty 1Year / US, 2 Year EU. When all power supply start-up conditions are met, the PSU will wait this time before continuing with the start-up sequence. If the input voltage is beyond this threshold and all other start-up conditions are met, the PSU can start. Instantly turn off the PSU if the input voltage is below this threshold. If the input voltage is below this threshold and all other start-up conditions are met, the PSU can start. If this condition is not satisfied during run time, the PSU will turn off instantly. If input voltage is below this threshold during IGN_OFF_TO_MOB_PULSE_OFF_TOUT then shutdown sequence will be initiated immediately. If input voltage is below this threshold during HARDOFF, output will be turned OFF immediately depending on CONFIG1 bits. If ignition voltage is beyond this threshold, ignition is considered to be ON. If ignition voltage is below this threshold, ignition is considered to be OFF. After ignition is considered ON, the PSU will wait this time before the output is turned ON. After the output is turned ON, the PSU will wait this time before the THUMP output gets enabled. This setting is only valid in automotive mode. After the output is turned ON, the PSU will wait this time before sending the start-up pulse to the motherboard. The length of the start-up/shutdown pulse sent to the motherboard. After the motherboard boots up, the ignition voltage sensing will be disabled for this period. If ignition is considered to be OFF, the PSU will wait this time before sending the shutdown pulse to the motherboard. This shutdown signal can be sent through the ON/OFF pins or through USB, depending on the configuration of the CONFIG1 parameter. After the shutdown pulse is sent to the motherboard, the PSU will wait this time before the output is turned OFF. This time-out allows the operating system to perform a clean shutdown. 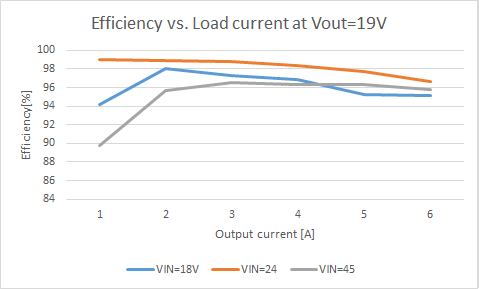 Output current limit setting. Resolution is 1280mA, minimum setting is 560mA. bit4:If set, the PSU can shut down the OS by USB by sending a Power Button event. 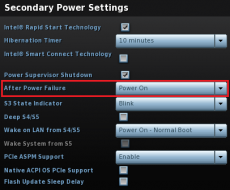 bit2:If set, shutdown pulse is enabled through the PWRSW connector. bit1:If set, startup pulse is enabled through the PWRSW connector. bit0:If set, output power cycle is enabled during HARDOFF period so it can reset the connected sytem. If output power measured is higher than this threshold the connected motherboard is considered to be ON. Together with POUT_LOW_THRESHOLD parameter sets a hysteresis for motherboard status. If output power measured is lower than this threshold the connected motherboard is considered to be OFF. Together with POUT_HIGH_THRESHOLD parameter sets a hysteresis for motherboard status. The number of times the internal Flash program memory has been written. The DCDC-NUC implements one generic USB class (USB HID), therefore most of the operating systems are recognizing it without any additional driver installation. The configuration software provides interface for DCDC-NUC monitoring, logging and setup. It's recommended to be used by users with deeper understanding of the DCDC-NUC hardware since permits setting voltages, currents and other parameters which can be dangerous if they are set without precaution. The configuration software has two main screens (Status and Settings) and a header with the important voltage/current values. The first main screen is the "Status"
The title bar shows the connection status, the firmware version and the mode of the DCDC-NUC. Example: "DCDC-NUC Connected v1.0 Mode: Dumb"
The "Status" screen contains extended information about the current state of the DCDC-NUC like internal state machine, voltages, currents, temperature, different read only state flags. The user also have the possibility to log the current state into a *.csv file in the "Log" section. The "Debug" section is for debug/support and can change between different firmware versions. The second main screen is the "Settings"
This screen contains two main sections: the individual parameter setup for experienced users and the parameter save/load into/from file section. The main section of the "Settings" screen is the individual parameter settings. This is recommended to be done only by experienced users. Any parameter of the DCDC-NUC can be set from here. - select the desired parameter from the "Parameter" list (simple click to select, double-click to edit). Below the parameter list a helper text is displayed (same from this manual). - after You have done with all parameter setting press the "Sync all parameters to the DCDC-Nuc" button to send all values to the DCDC-Nuc. IMPORTANT: without this step the new values will be lost, nothing is sent to the DCDC-NUC! - keeping the "Reload parameters on the fly after sync" checked. Do any parameter change with precaution, check the parameters and wires before applying it! For users who need to setup more devices with the same DCDC-NUC settings, it is recommended to use the save/load parameters buttons. The "Parameters: DCDC-Nuc ===> File (settings.ini)" button loads a full configuration from the DCDC-Nuc and saves it to the settings.ini file. You can disconnect the current DCDC-Nuc from the USB and insert a new one, than press the "Parameters: DCDC-Nuc <=== File (settings.ini)" button to send the last saved configuration into the new DCDC-Nuc. The "Parameters: DCDC-Nuc ===> CSV File (settings.csv)" button loads all parameters from the connected DCDC-NUC and saves it into a csv file. This type of file can be opened by any spreadsheet editor (OpenOffice, Microsoft Excel etc.) and contains the full set of parameters in human readable form. Every save/load/sync operation on the "Settings" screen affects the progress bar and the status bar on the bottom of the screen (labelled with "State:"). In rare cases You might get error here with "try again" message. This happens in case of one parameter byte get's corrupted or timeout occurs during USB communication and/or DCDC-NUC flashing operation. Please try again and contact our support team only if the device gives this error 4-5 times in a row. 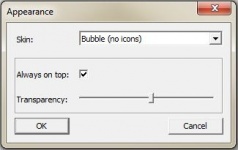 The system monitor is a tray bar software which shows the current state on the tray bar icon and a semi transparent "always on top" capable small window. The popup window can be moved anywhere on the screen and can be customized. Our current setup has two skins but any combination is possible playing with the "skin*.mbs" files installed together with this application. The current skin can be selected right clicking on the try icon. The "skin*.mbs" files are simple text ones editable with any text editor (notepad for example). Adding a new skin is pretty simple – make a skin1.mbs (use the existing skin0.mbs for starting content) and start playing with the values from the new file. For auto start with the system make a shortcut of AppTray.exe from the standalone package in the system Startup (Windows 7, Windows 8). Mini-box.com provides one DCDC-Nuc API in a DLL (NUCLib.dll) and examples in Visual C++, Visual Basic and Visual C#. Basic C++/Visual Basic/C# knowledge is needed to use this examples together with the API. The API dll has manifest embedded to permit C# and Visual Basic dynamic load. See the examples for usage. IMPORTANT: the API dll needs 4 files from Visual Studio 2005 redistribution pack (Microsoft.VC80.CRT.manifest, msvcm80.dll, msvcp80.dll, msvcr80.dll). IMPORTANT: the API supports only one DCDC-NUC connected to the computer. Open DCDCNUCTestAPI.sln from the package, set CLibTest project as active project, run it and see CLibTest.cpp for usage example. Open DCDCNUCTestAPI.sln from the package, set VBLibTest project as active project, run it and see Module1.vb for usage example. Open DCDCNUCTestAPI.sln from the package, set CSLibTest project as active project, run it and see Program.cs for usage example. This page was last modified on 21 September 2018, at 01:27. This page has been accessed 284,815 times.